Going into Town is a guide to moving to Manhattan and learning to enjoy it, although it would be equally good for tourists. It is a revised version of a booklet Chast created when her daughter moved to NYC for college. Chast wanted to explain the basics of how to get around town, what to do for entertainment, and how to appreciate the beauty of the city. 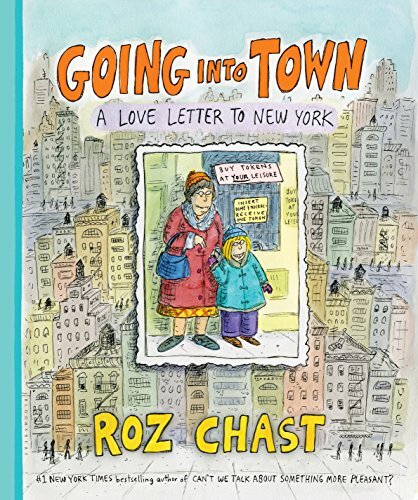 It has a mixture of personal anecdote and facts about the city, illustrated in Chast's familiar style, along with a few photographs. It is entertaining and charming in its quirkiness. Chast highlights the standpipes which populate the city and remarks on their beauty. She loves the collection of different stores and offices you will find in a typical building on a street. She recommends walking around and enjoying the parts that most people would not look at. She does provide a nice drawing of Grand Central Terminal, but she mostly avoids popular tourist attractions. The book is a quick read and provides some insight into the difference between city life and suburban life. But it is rather bland, and says very little about the different regions of Manhattan, which have very different characteristics. It has virtually nothing about the other boroughs. So it is very basic in its practical advice, and should be enjoyed mainly for the pictures.